Egyptian Walking Onions Egyptian Walking Onions grow perennially in a bed. Hardy bulbs set bulblets on stalks. Air bound bulblets will sprout new smaller stalks, which fall over and replant themselves, hence the name Walking. 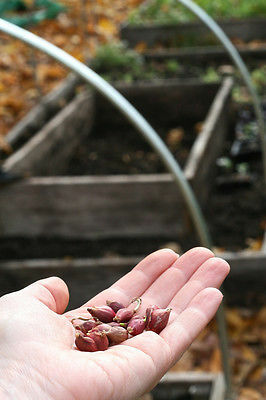 Plant them where you intend to have them for a long time, as they are quite hardy. Delicious green onions, with shallot-like bulbs growing atop tall stalks. A perennial, bunching onion variety used like a scallion. Thin white onions with long tubular greens 1 half to 1 inch wide or larger, and 12-36 inches long. Instead of small black seeds this plant produces bulb sets on the flowering end of long tubular branches. If left to their own design, these seed tops will fall over and the bulblets on top will sprout roots with fall moisture.